Play MP3 songs, from a micro-SD card, randomly, forever. 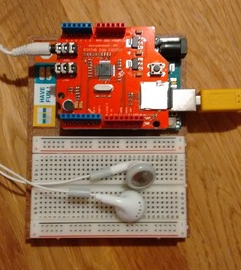 A sparkfun MP3 Player Shield - such as this official product. Or a cheap clone, such as this one I actually purchased. Plug the two boards together. You'll notice I explicitly didn't create a partition. I just used the raw block-device. In this project we read the filenames from the card, and play then regardless of what they are - via a different API function (blah.playMP3(filename);). So long as you avoid UTF-8, and use filenames that honour the 8.3 format you're fine. The code for this project has pretty much already been written for us! What we need to do is clone the appropriate library to our local Arduino development-host, then we can merely load the examples for the functionality we need. remote: Counting objects: 3303, done. Receiving objects: 100% (3303/3303), 3.13 MiB | 1.26 MiB/s, done. Resolving deltas: 100% (2158/2158), done. Once that is done you can open your Arduino development-environment and load the examples. There are two sets of examples - one for the SD card-reader, and one for the player. I'd suggest starting with the former. Click on the Menu-item "File | Examples | SdFat | SdInfo". This will load a program which will dump details about your SD-card. Compile it and upload to your board, then open the serial-console. Data area is not aligned on flash erase boundaries! Download and use formatter from www.sdcard.org/consumer! At that point you can see a menu on your serial console, which will let you control the audio. Taking code from the samples seen above I've put together the following application, which picks a random file from the SD-card, plays it, then repeats forever. // Below is not needed if interrupt driven. Safe to remove if not using. \brief Object instancing the SdFat library. principal object for handling all SdCard functions. \brief Object instancing the SFEMP3Shield library. principal object for handling all the attributes, members and functions for the library. \brief The PIN for our SD-card reader. This is pin 9 on my board. This function reads ALL the files on the SD-card, to count them. one, and start playing that particular track. // Configure the serial console output. // breadboards. use SPI_FULL_SPEED for better performance. Because randomness is non-perfect you might find track 6 plays 100 times in a row. Keep track of the most recent track(s) and avoid repeating them immediately. This will fail if you only have a small number of files though, because all tracks will be recent. Wire up an IR-based controller. Wire up an LCD display for showing the currently-playing song.